No Coal in Oakland submits this memo to refute the ten falsehoods in Mark McClure’s Open Forum Opinion published on March 14, 2016. Accompanying this memo are five Letters to the Editor also published by the SF Chronicle refuting McClure’s misinformation. Fact: CCIG in its newsletter promised that they had “no interest or involvement in the pursuit of coal-related operations at the former Oakland Army Base.” When CCIG, Mr. McClure’s company, applied for a lease on the former Army Base, they still publicly maintained that they did not intend to ship coal. It was only a year ago when a newspaper in Utah broke the story of Utah’s $53 million investment in the project that Oakland residents even learned of plans to ship coal through our city. Emails between Oakland developers and Utah financiers for the proposal emphasized that “the script was to downplay coal” and “less press is best.” There is nothing open or transparent about the way CCIG tried to sneak coal into OBOT. Fact: In its Development Agreement, the City of Oakland retained the right to regulate the terminal in order to limit health and safety risks. CCIG agreed to this clause. There is no taking of vested rights if the City exercises that right as defined in clause 3.4.2. Fact: OBOT is part of a development that relies heavily on funding from the state of California, and the attempt to use the terminal for coal is linked to public funds from the state of Utah. The California Transportation Commission (CTC) invested $242 million in the horizontal infrastructure needed to develop the former army base property. Without this funding, OBOT would not be possible. Regarding Utah funds, see the next section. Fact: Public records show that McClure personally went to Utah last April to ask its Community Impact Board to invest in OBOT. Whether or not CCIG dreamed it up, the Utah legislative action is an attempt to salvage the investment for which CCIG has lobbied. Exporting coal requires public funding because the private market is shunning coal investments in the wake of multiple coal company bankruptcies. Fact: Coal is not transported through Oakland “on a regular basis.” In fact, there have been only two or three sightings of coal trains in the past 12 months coming through Oakland. Those highly unusual instances were due to the Richmond terminal running out of space and separate dispatcher error. Even if all Richmond coal came through Oakland, it would be one-tenth the amount projected for OBOT. The “measurable impact” of a pollutant increases when the quantity of that pollutant increases. Fact: The claim that coal is not regulated as a hazardous substance by the federal government is patently false. Coal dust is on the Occupational Safety and Health Administration’s list of “Toxic and Hazardous Substances.” See also (“Coal dust is listed in 1910.1000 Table Z-1 and is automatically considered as a hazardous chemical for the purposes of hazard communication.”). The Proposition 66 list is a list of chemicals that are hazardous to human health, and does not purport to list all “substances” or “materials” or “minerals” that pose health or safety issues. Neither rat poison nor dynamite nor plutonium appears on the list. Toxic chemicals contained in coal dust—such as arsenic—are on the list. See list here. Fact: We are not “project opponents.” Our opposition is only to coal. No Coal in Oakland supports construction and operation of the bulk commodities terminal project; some NCIO activists have been involved in helping convert the Oakland Army Base into a global trade and logistics center for years. We have never framed the terminal development as “a choice between jobs or health.” With other commodities, workers can have jobs that don’t threaten their health. There are 15,000 other bulk commodities that could be shipped through OBOT. These include many California agricultural crops, which represent jobs for Californians. Shipping less toxic commodities, in fact, may create more jobs than the handling of coal. Fact: The item funding ESA was withdrawn from the Council’s February 16 agenda, as the mayor put it, “so that we may further evaluate other, potentially more effective options”—not because the evidence wouldn’t withstand scrutiny. Fact: McClure and his partners are mistaken if they think the opposition to coal is coming from “narrowly focused special interest groups.” The ranks of those who are opposed to their plan to sell out Oakland to the coal industry comprise a wide swath of religious, labor, community, health, and neighborhood groups and other city residents. A partial list of those who have signed letters opposing coal can be accessed here. Regarding “Coal is already part of bulk terminal plan” (Open Forum, March 14): Mark McClure is not doing the city of Oakland any favors by supporting the bulk export terminal at the Port of Oakland. He argues that the terminal should be built because the Port of Oakland approved it in 2012. He actually says that coal poses no health risks because the environmental impact statement in the Pacific Northwest confirmed that there are no health and safety impacts from the transport of coal by rail. Does he not know where coal comes from? Does he dismiss the impact of coal on the lives of the people who mine it and the people who will breathe the air where it is burned? Is he blind to the abysmal cleanup record of coal companies after they have finished extracting what is economically profitable? Speaking of profitability, doesn’t McClure realize that coal will be the first fossil fuel that will be phased out? The ubiquitous human capacity to ignore the threat of climate change is on full display in Mark McClure’s “Coal is already part of bulk terminal plan.” Nowhere does he mention that coal, a dying industry in the U.S., is the fossil fuel responsible for the highest rate of carbon emissions. Scientists, the Paris Climate Agreement and the U.S. president all agree we must leave fossil fuels in the ground. A good place to start is to refuse to ship coal through Oakland. Private profit should not win out over the future and health of our human species. Regarding “Coal is already part of bulk terminal plan” (Open Forum, March 14): Coal is shipped through Richmond, but it’s a small fraction of the amount proposed for the Oakland terminal. Rail cars carrying coal come through Oakland, but very rarely, only when the Richmond terminal runs out of space or a dispatcher makes an error. The environmental lawsuit was withdrawn because of timing, not validity. The city council did not withdraw a related agenda item in February because the concerns about coal transport won’t stand up to legal or scientific scrutiny, but to consider less expensive alternatives. Rather than soundbites, concerns about coal comprise hundreds of pages of scientific evidence. This is not a choice between jobs or health. There are many bulk products that could provide jobs, in some cases even more than coal. This is not a taking of vested rights but the exercise of a contractual clause embodying the city’s right to protect the health and safety of its residents. We need to convert existing infrastructure to sustainable energy sources, not cling to toxic coal. In April 2014, the Utah Permanent Community Fund Board, a special state agency that makes grants to rural Utah counties for sewers, fire stations and other municipal improvements, quietly approved an unusual $53 million low-interest loan to Sever, Carbon, Emery and Sanpete counties. In a presentation to the board, Jeffrey Holt and several commissioners representing the four counties said the funds would contribute to a $200 million maritime terminal in Oakland that would export many different commodities. Appearing with Holt and county officials was Mark McClure, vice-president of California Capital Investment Group. Utah SB246 would authorize $53 million in public funds for investment in an expansion of Port of Oakland and is intended to allow Utah to have an export portal to its sizable coal market to buyers on the Pacific Rim. Environmental groups in both Utah and California have launched an aggressive campaign in opposition to the proposed Oakland Coal Terminal and the Utah legislative manipulation of the $53 million dollar through SB246. Additionally, in California, the call for divestment of funds from coal have come from the California Public Employees’ Retirement System and the state’s teachers retirement fund, and Insurance Commissioner Dave Jones has asked all insurance companies in California to voluntarily divest their funds in coal. Now, it’s time for California Attorney General Kamala Harris to contact Utah Attorney General Sean Reyes to advise Utah Gov. Gary Herbert not to sign SB246. 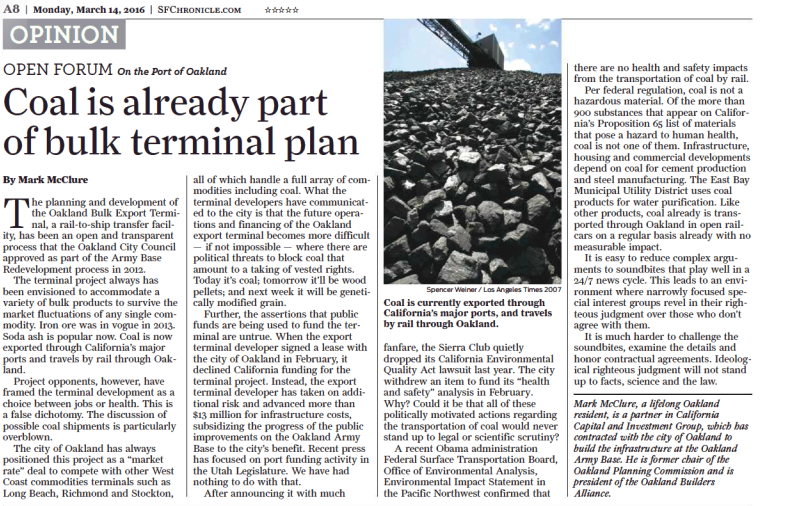 Regarding “Coal is already part of bulk terminal plan” (Open Forum, March 14): The proposed coal export terminal at the Port of Oakland was portrayed as benign business-as-usual because coal is already part of the bulk terminal plan. But today’s environmental news tells us otherwise. As measured by global average temperature, last month was the warmest February on record, by a large margin. Climate observers know that business as usual in this context is very dangerous, for the effects of coal exports go far beyond local health concerns. We now know something we were unsure of just a few years ago: That climate change due to pollution from combustion of fossil fuels threatens coastal cities and low-lying islands, and will modify weather conditions around the world at such a rate and to such an extent that adaptation may be impossible. If we as a society learned anything during the climate negotiations in Paris in December, it is that facing down climate change to ensure a better future is everyone’s responsibility. Contrary to the article’s implication, opposition to the coal terminal is not a casual and vain gesture of political correctness. It is an attempt by conscientious citizens to prevent the city’s participation in environmental crimes against humanity.